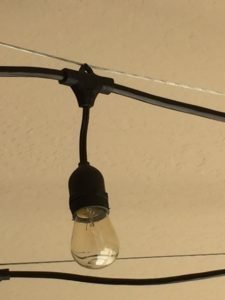 DIY String Patio Lights – A simple project I did around the house recently. 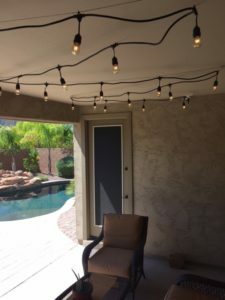 My wife had requested some string lights for our patio in the backyard and sent me on my way. The idea was to change the harsh glare from the one outdoor patio light to a softer more welcoming atmosphere. After checking Home Depot and Lowe’s I didn’t find anything that I particularly liked. 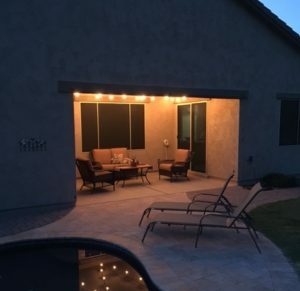 Part of the problem was the lights were fairly expensive and just weren’t very long, meaning I would have to buy at least three sets to adequately cover my patio area. I finally found these Feit String Lights at Costco priced at $49.99. The length of 48 feet was about right and the lights appeared to be fairly high quality. 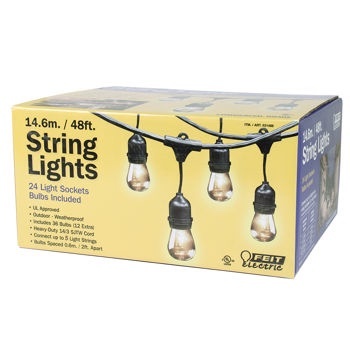 You can also get them from Amazon here-Feit 48 ft Outdoor String Lights . Here is a picture of the area that I was working with. The dimensions of my patio is 16 ft in length by 11 ft wide. 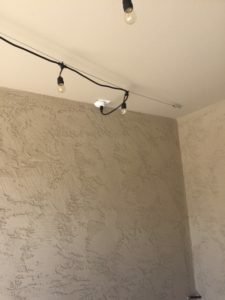 The total length of the Feit Patio String Lights at 48 feet would give me approximately six runs at 8 feet each, which I could zig zag from one end of the patio to the other. I used a stud finder and located the ceiling joists, which ran lengthwise, so I could install eye bolts for the mounting hardware. The location of the studs made my actual patio working depth 8 feet. I figured out the pattern I wanted and installed the eye bolts along the front and rear ceiling joists, offset from each other. For my situation I placed each eyebolt about 4 feet 6 inches apart, three on the front joist and four on the rear joist. 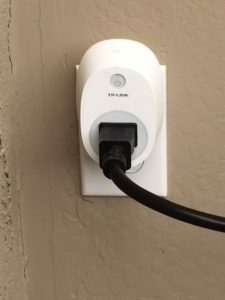 (NOTE: I had an outlet installed on the ceiling at an earlier date because I plan to add an outdoor television at some point. 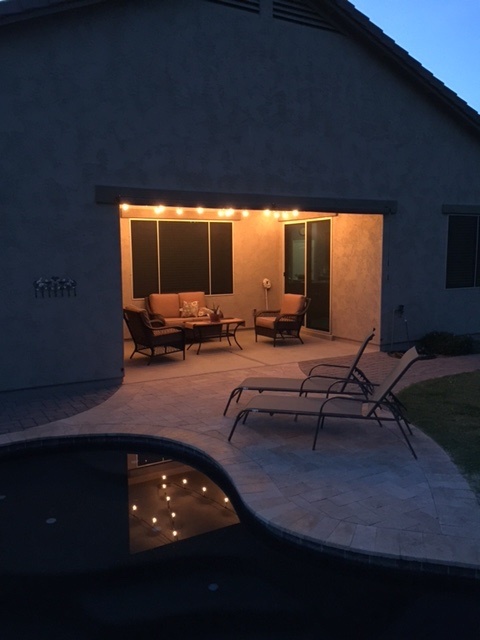 This worked out great for the patio lights because I don’t have any electrical cords hanging down the wall. 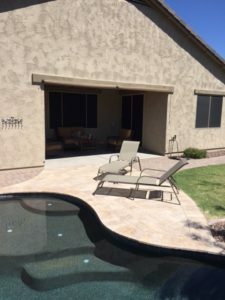 Make sure you factor in your outlet location when laying out your patio light pattern). 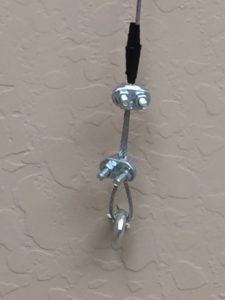 Starting at one end, I ran my unsheathed cable through the eyebolt and secured it with two wire rope clips. 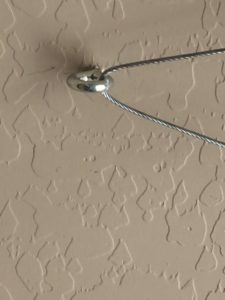 I then strung the cable through all of the eyebolts in my zig zag pattern and secured the end with two more wire rope clips.